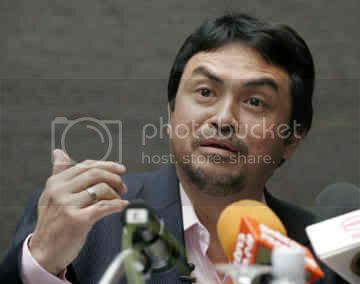 Political analyst Abdul Razak Baginda said today that Deputy Prime Minister Datuk Seri Najib Razak had never met his Mongolian lover Altantuya Shaariibuu who was brutally murdered two years ago. Abdul Razak was recently acquitted of the charge of abetting in the murder of Altantuya in one of the country’s most sensational murder trials. While Abdul Razak was acquitted, two policemen are still facing trial for the murder. His relationship with Najib and the sensational nature of the murder in which Altantuya’s body was blown to bits with C4 explosives have sparked allegations and numerous questions over possible political conspiracies. Najib and Rosmah have been the subject of often wild allegations about their involvement. This has resulted in a smear on the record of Najib, who was recently elected unopposed as Umno president and is expected to become the next Prime Minister in March. Today his friend and adviser Abdul Razak attempted to help clear his name. He said that there was no link between the deceased and the submarine deal which has been the subject of widespread speculation as the motive for the murder of Altantuya. He said the “purported deal” was inked in June 2002 but he had only met the deceased in late 2004. “Everyone is lazy and did not check the facts. I fail to see the connection. These are vicious lies,” he said. He was also visibly agitated at a suggestion that he was still not exonerated in the court of public opinion. “You talk about it as if it is a coherent consensus. I do not want to pander to so-called public opinion. Can a blogger reflect public opinion? Then I can run you down as well, mate,” he sniped. Lifting up a tape recorder, he said if the press chose to report him as holding a gun or whisky, he could not be responsible for that. Abdul Razak also said that he has had no contact with Najib since his release. “I have not met him, seen him, spoken to him, SMSed him, e-mailed him. Not at all,” he exclaimed. He clarified his relationship with Najib, saying that it has “evolved” since it began professionally in the ‘90s, and they have since become personal friends but he has never held an official position with Najib as a member of his staff and could not be classified as an “aide” as was often reported. He said his immediate concern now was to return to Britain as he was a doctorate student at Oxford and had submitted in September 2006 his dissertation which was placed on hold due to his arrest. He bristled at a suggestion that he would not return. “Why the hell should I run away, I am innocent. You will see me back in a few months after I get my doctorate unless I get a cushy job like the Prime Minister of the UK,” he quipped. He also refused to comment on several issues such as why he was implicated in the first place, his relationship with the two accused police officers and why he dropped prominent lawyer Datuk Shafee Abdullah when he was finally charged with abetting the two police officers, saying that a trial is still proceeding and legal ethics had to be adhered to. He, however, denied that he had met Altantuya at a party as reported in the media and said that a photo of him, Najib and the deceased was doctored. As for the recently leaked text message exchange between Najib and Shafee which led to claims of abuse of power, he said that by that time he was already in remand and he could not imagine how there could be a suggestion of interference. “How can there be any intervention if I went through all that? God almighty, come on,” he said. He added that while he was sympathetic to the family of the deceased, he has never met them and if they chose to bring the matter to an international court, it was up to them. Abdul Razak also expressed surprise that he has not become “a leper”. who gives any benefit to the murdered deceased? This sad issue has been going for months now and it’s just being complicated more and more, but good Malaysian & Mongolian people we already know the truth!!! We know the masterminds and it’s all before our eyes. The so-called leaders are PURE LIARS when it comes to transparency in all government duties, so why should we now believe they are innocent of Altantuya Shaariibuu’s brutal murder??? NAJIB RAAZAK and RAZAK BAGINDA sponsored Altantuya’s murder and there’s no more doubt about it! Malaysia claims to be a religious country with disciplined leaders, but i see NO DISCIPLINE, GOD’s FEAR, PRINCIPLES and GOOD FORM OF LEADERSHIP in what has been going on for years in Malaysia and especially the murder of Altantuya. If truly Malaysia follows the True Islamic Laws and Najib Razak and Razak Baginda are True Muslims, they should CONFESS and both be brought to JUSTICE!!! We dont care if Najib Razak is going to be the next Prime Minister!